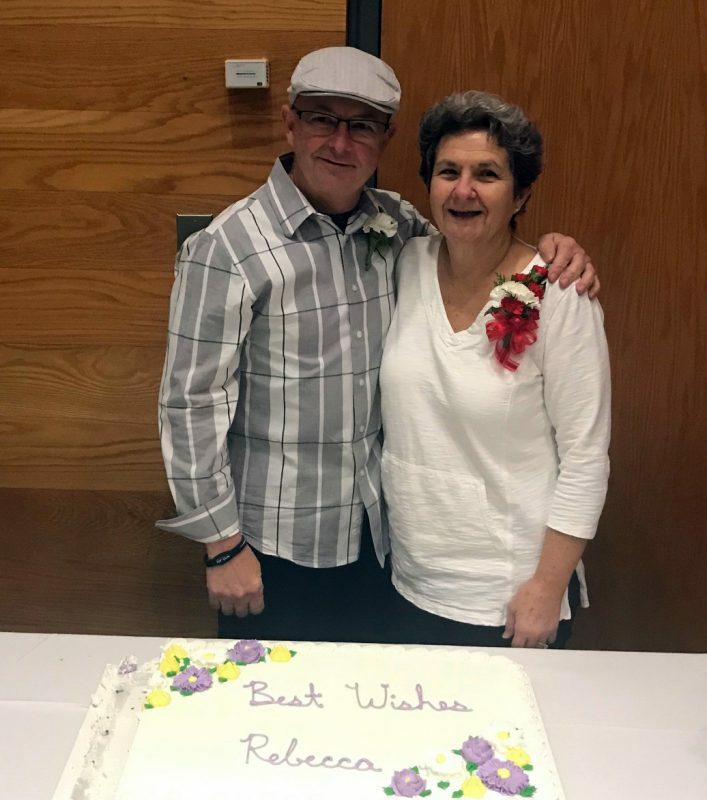 Becky Bowman Horton retires after 41 years as a nurse at Akron Children’s Hospital. ​As someone with hard-to-find veins, Becky Bowman Horton, staff nurse in the Showers Family Center for Childhood Cancer and Blood Disorders, knows firsthand how multiple needle pokes can lead to anxiety and fear. It wasn’t in vain that she became an expert in PICC (peripherally inserted central catheter), midline and PIV (peripheral intravenous catheter) insertion. In fact, her dexterity and the speed at which she inserts IVs earned her many nicknames among her appreciative patients, ranging from IV diva and vampire nurse to harmless monster and the GOAT (greatest of all time). 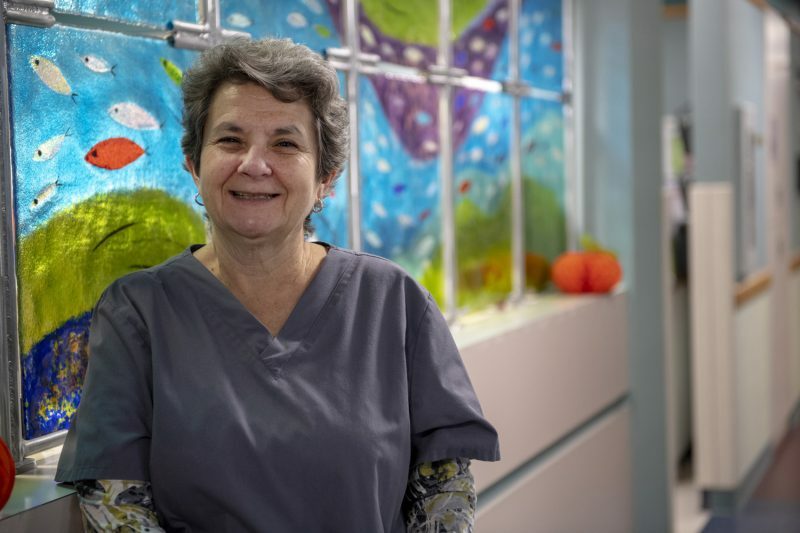 After 41 years at Akron Children’s, Becky retires on Nov. 29. Even though she admits it will be hard to walk away from Children’s, she knows time spent with her family is precious. She plans to enjoy her family time, take trips to Florida and work on her rental property. As a student at Idabelle Firestone School of Nursing, I rotated through Akron Children’s, sometimes crying for the sick kids. I thought I couldn’t work with sick children. My first job was in geriatrics for a small hospital, but I grew bored. When I told a nursing school friend who worked at Children’s, she suggested I apply here. I interviewed with Mary Griffin, the night supervisor, who offered me a job in neonatal. I thought that was a drastic change from geriatrics, so Mary hired me to work in adolescent medicine/behavioral health instead. My first 7 years, I worked in adolescent medicine/behavioral health, which was combined at the time. After the birth of my first child in 1983, I became a float nurse, working part time in neonatal intensive care unit (NICU), the Paul and Carol David Foundation Burn Institute and wherever I was needed. In 1995, I joined PICU full-time, and 6 years later, I moved to the newly formed PICC and sedation teams. I went to the hematology/oncology clinic in 2006, where I’ve been the last 12 years. I helped form and start the PICC and sedation teams, which have expanded into the current vascular access team. When the hospital started up these teams, it required special training, such as working with other hospitals and traveling to Baltimore, as well as developing procedures and policies. How has Akron Children’s changed since you started here? The acuity level is higher now, resulting in much sicker children being admitted. It used to be if a child came in with belly pain or a headache, they were admitted to the hospital for a workup. Nowadays, those concerns are addressed on an outpatient basis. We’ve also added an oncology unit to address the sheer number of kids needing this specialization. The unconditional love and trust we get from the kids, no matter what we do to help them get better. It’s why I say I live for IVs. When a child is scared or has a bad experience, and I’m able to insert an IV without causing them pain, I know I’ve helped put their mind at ease so they can relax. The kids who tease, joke and pull pranks. I remember one child. After 3 attempts to insert an IV, we sent him home. The next day he came in with a big, swollen arm. I was shocked, and asked, “Did we do that?” He pulled a scarf out from under his sleeve and laughed because I fell for his joke. When an Amish girl called me “Grandma,” her mother told me she didn’t have a grandmother. What an honor! What you think is your niche, may not be your calling. Be open to working in different areas and trying new opportunities. Becky with her husband during her Retirement Tea at the hospital. No alarm clock waking me up, enjoying a diet cola on the deck, hiking the Summit Metro Parks trails and strolling the Florida beaches with my husband. I’m also looking forward to more family time with my 3 children and 4 grandchildren, who live in Akron. What’s the last book your read?